Nineteenth century American Painting in art history was influenced by the development of a new nation. America established it's own traditions, it's own government and it's own institutions. American artists were individualists as were most Americans and instead of painting or following European traditions they chose to paint the influences and traditions of a growing American culture. A few American artists traveled abroad but any stylistic changes or influence usually remained secondary. American Painting began in 1825 with Thomas Cole and the Native School of painting ending in 1910 with the artist Winslow Homer. The Native School period started with landscape painting. Famous artists Thomas Cole, Asher Durand, and William Cullen Bryant "made it clear in their writings that our" (American) "landscape painting represented a resolution of the conflict between an idealistic, religious disposition and a demand for the quiet observation of fact. The wilderness as Cole put it, was a fitting place to speak of God". This period of painting was offered to the American public as a whole and not only to a few. The American Landscapes "required of the less imaginative no special knowledge of history or style and could offer them at the very least the solace of a woodland view painted in an unassuming, more or less realistic style. 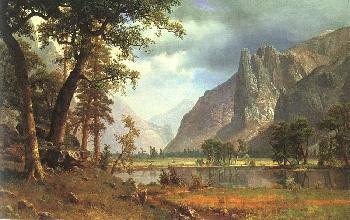 Other Famous artists this period were Albert Bierstadt, Frederick Church and Fitz Hugh Lane. To learn about selected artists of the American period click on the links below. To view selected paintings from this period click on the graphics below to enlarge the paintings.